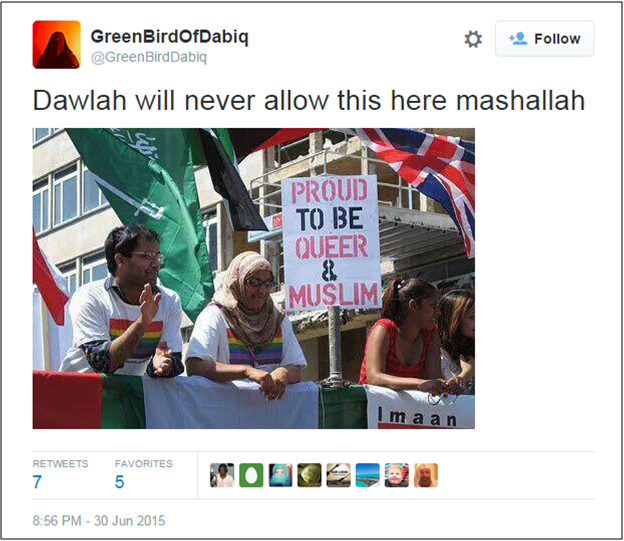 Twitter personality “GreenBirdofDabiq” is an advocate of militant Islam on social media. 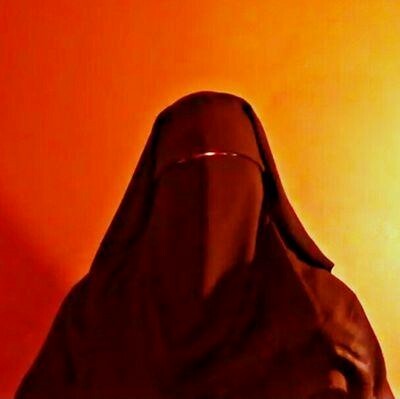 Proclaiming to live in Raqqa, Syria (ISIS’s de facto capital), she regularly advertises the terror group’s latest exploits and summons Muslims from around the world to venture to the self-proclaimed caliphate.GreenBirdofDabiq, Twitter post, June 28, 2015, 9:55 p.m., https://twitter.com/GreenBirdDabiq/status/615382985634754560. GreenBirdofDabiq draws her name from Dabiq, the town in northern Syria that is, according to certain readings in the Muslim canon, the site of the final clash of armies before the apocalypse. 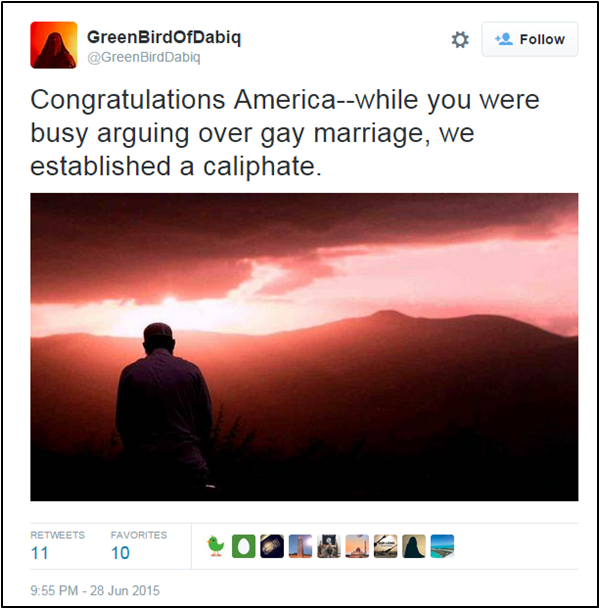 GreenBirdofDabiq frequently promotes anti-gay material, including posting pictures promoting gay rights and claiming that ISIS would never abide such freedoms.GreenBirdofDabiq, Twitter post, June 30, 2015, 8:56 p.m., https://twitter.com/GreenBirdDabiq/status/623022031697657856. 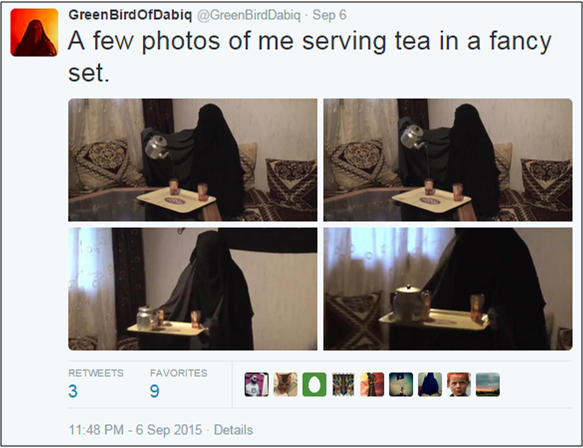 GreenBirdofDabiq regularly attempts to glamorize life in ISIS-held territory by posting pictures of her serving tea in garish surroundings.GreenBirdofDabiq, Twitter post, September 6, 2015, 11:48 p.m., https://twitter.com/GreenBirdDabiq/status/640778566301450240. Another feature of GreenBirdofDabiq’s Twitter feed is constant disparagement of the decadence and moral unseriousness of the West. Specifically, GreenBirdofDabiq cites the moral outrage in the West against big game hunters, and contrasts this with the silence that attends mass atrocities against civilians in Syria.GreenBirdofDabiq, Twitter post, July 29, 2015, 11:16 p.m., https://twitter.com/GreenBirdDabiq/status/626637429617758209. 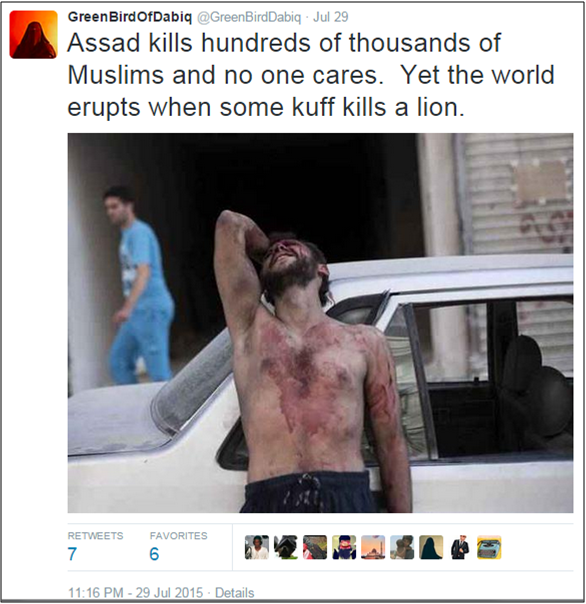 Twitter personality “GreenBirdofDabiq” is an advocate of militant Islam on social media. “We don’t want your ‘freedom’.” (Tweet)GreenBirdofDabiq, Twitter post, July 20, 2015, 2:50 a.m., https://twitter.com/GreenBirdDabiq/status/623022031697657856. “Dawlah [Islamic State] will never allow that here.” (Tweet)GreenBirdofDabiq, Twitter post, July 20, 2015, 11:56 p.m., https://twitter.com/GreenBirdDabiq/status/616092976440147968/photo/1.